Happy Wednesday, friends! 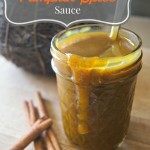 I’m SO excited to be a part of a little Thanksgiving Blog Hop! 11 bloggers have come together to bring you some wonderful DIY Thanksgiving tablescapes, decor ideas, and recipes! Make sure you visit all the other amazing posts to get some inspiration for your upcoming Thanksgiving events! First, I started by soaking my cans in hot soapy water for about 10 minutes. This softened most of the glue and the paper around the cans just fell right off. To tackle the remaining glue on each can, I used Goo Gone. Have you used this stuff before?! Let’s just say it makes life a whole heck of a lot easier when it comes to getting off sticky stuff on anything. I put a little bit onto a paper towel and just rubbed over the dried glue. Came off SO easily. Then I gave the cans a quick wash again with soapy water. I lined them all up in the height/order I want them to be in. With a Sharpie, I wrote each letter on the can. Don’t mind my mistakes on a few, I was debating doing lower case letters. As soon as I started hammering my nails for the “T,” I found that lower case would be much more difficult! 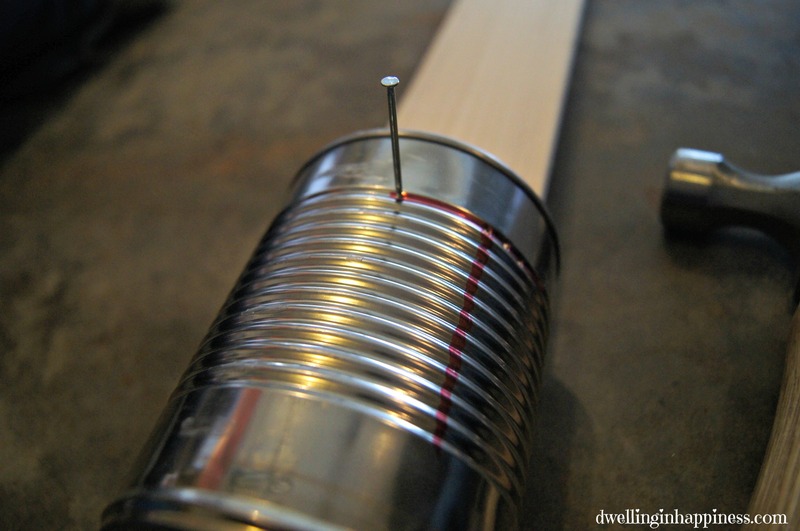 After trying to get the first hole in the can with the nail, I realized it was going to be much harder to do if I didn’t have some way of holding the can steady. I found a piece of wood that fit in all cans but one, and I just held the wood down with my leg as I sat. 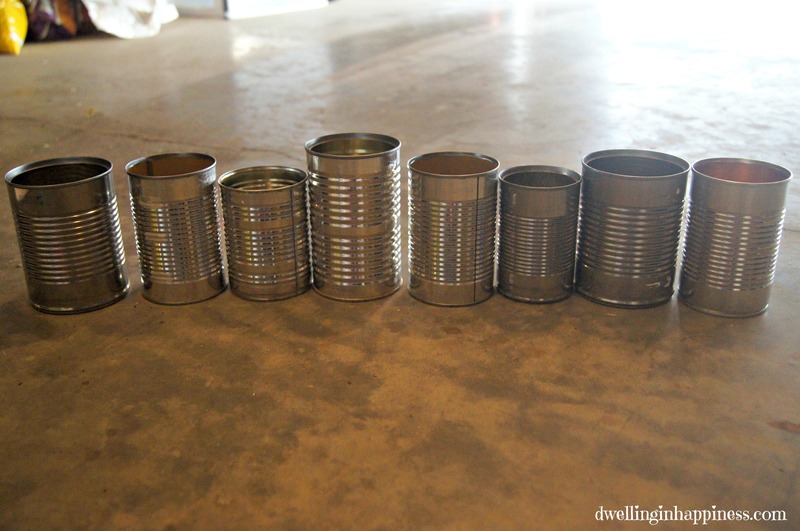 I hammered holes with the nail in the can about half a centimeter apart, until every letter on the cans was finished. *NOTE* I’ve read that another easy(ier?) 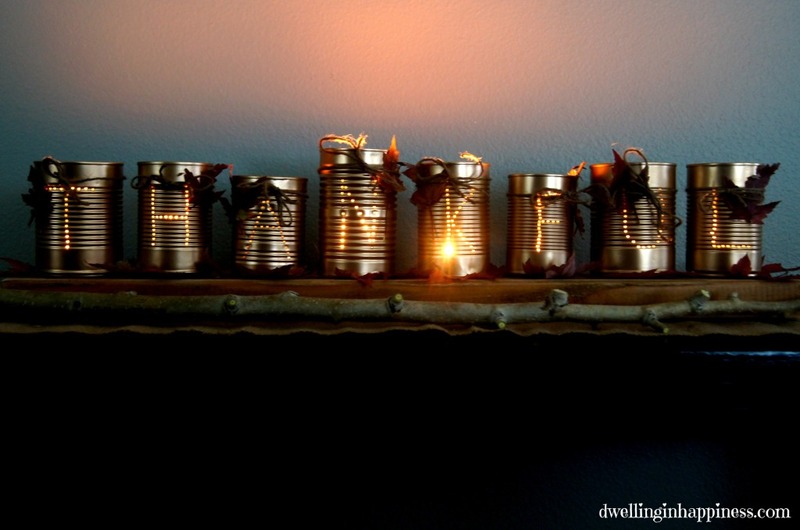 way of doing these luminaries is to fill up the can with water and let it freeze completely, then draw on your letters and hammer the nails in. I think the ice inside holds the can steady. I was impatient and didn’t want to wait for water to freeze in the cans, so I didn’t use that method. I might try it next time! If you go that route, let me know how it worked for you! 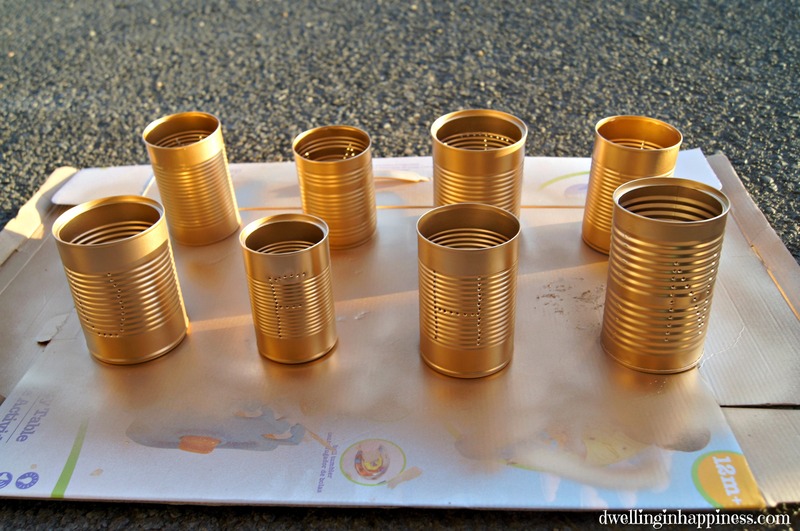 When all the cans had their letters, I spray painted them with gold metallic spray paint. 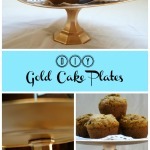 Because, everything is better with gold! Amiright?? And, I currently have just a tad bit of a gold obsession. I had some scrap wood laying around in my garage, and it was the perfect size to house the cans on top. 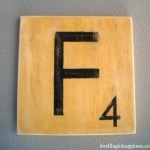 I gave it a couple of coats of a homemade vinegar/steel wool stain, then sanded it down a bit after it was dry. 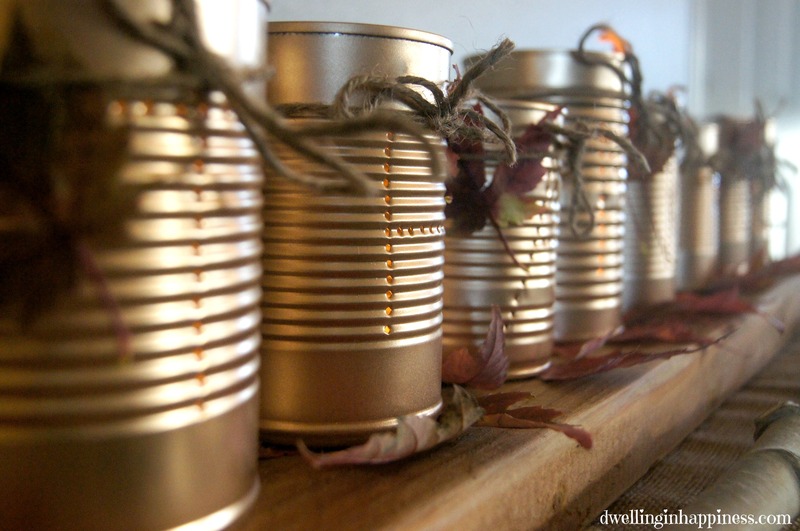 The cans still looked unfinished all neatly placed on top of the wood, so I added some twine and a leaf to each can. I also added a few leaves for the cans to rest on. And, now you have yourself a beautiful centerpiece to your Thanksgiving table! 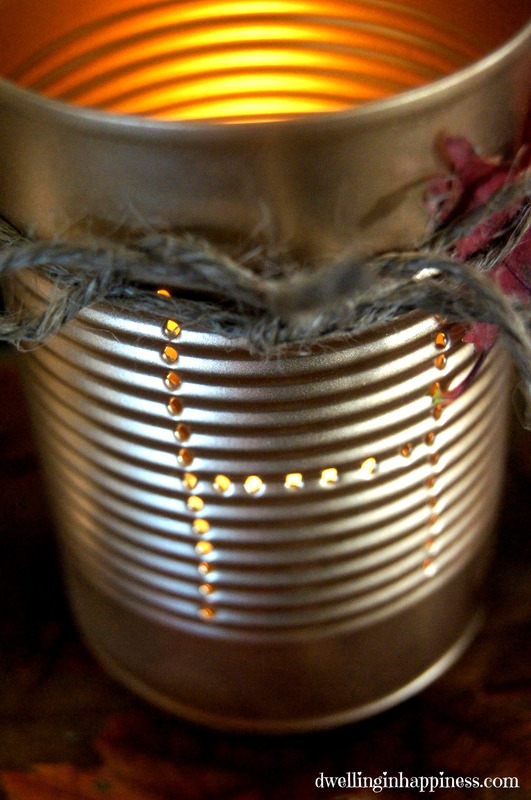 I just added a tea-light candle inside each can. Just be careful when you’re putting a candle in or lighting them, because the aluminum had to go somewhere each time a nail went in; meaning the inside of the can where the holes are is VERY sharp. You can easily file them down, but I just figured I’d be the only one lighting them and I’ll just be careful. 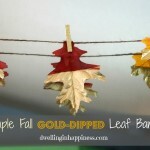 These look SO pretty lit up at night on my entryway table!! 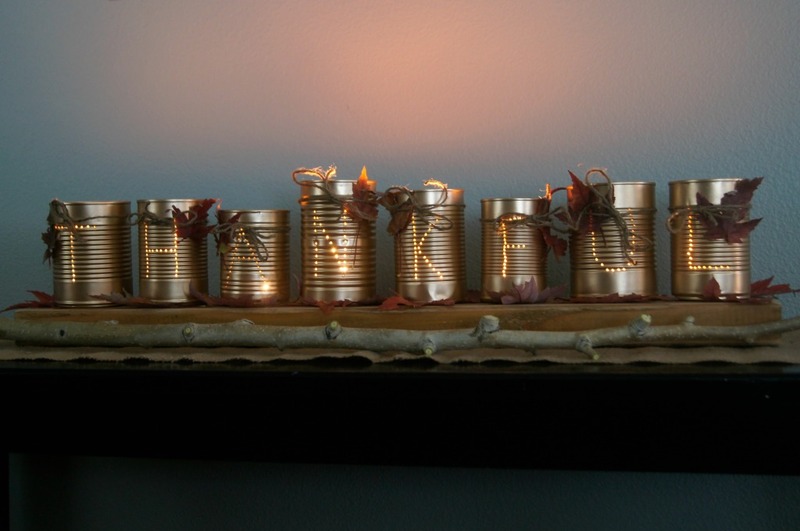 Be sure to check out all the other amazing Thanksgiving projects below! 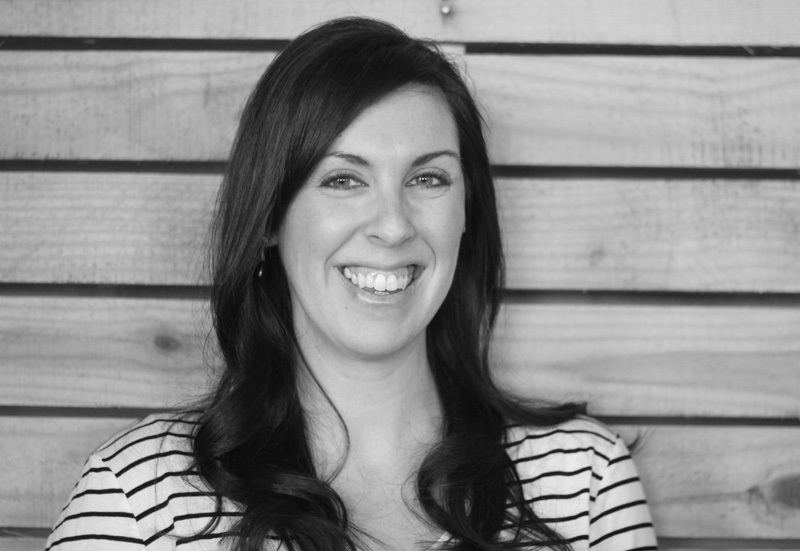 I guarantee you will find some great inspiration from these fabulous ladies! 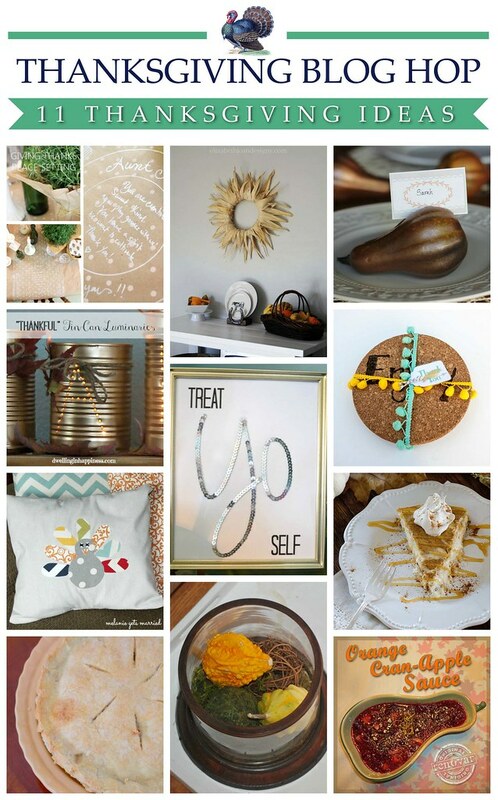 Pingback: Thanksgiving Decor Blog Hop: Inspiration Here- yes please! Amanda, these luminaries are so beautiful! Love how they turned out! Thank you, Christine!! You’re so sweet!! 🙂 SO appreciate the pin! These look beautiful all lit up! I love to light candles around my home every night this cozy time of year! I am going to start saving my tin cans for this! Love these! 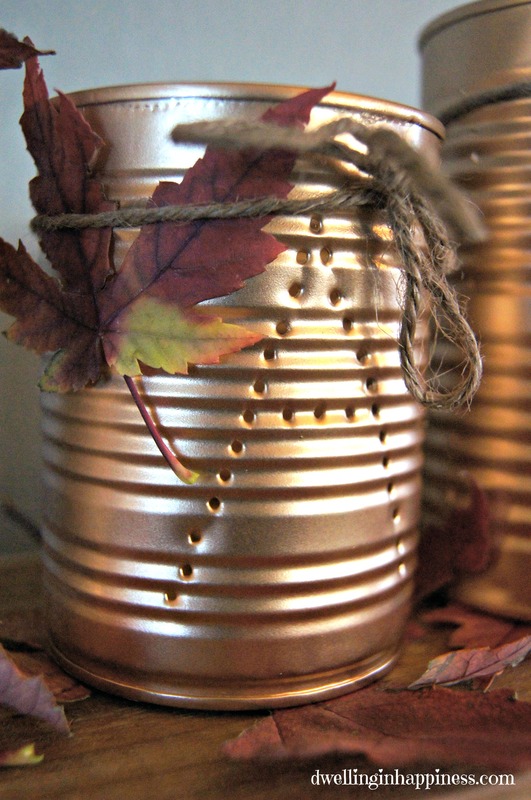 Super cute way to upcycle too! Thank you, Jenny! I love a good cheap upcycle project. 🙂 Especially when they turn out better than I was expecting! Hope you’re having a great week! Thank you, Laura! I just love them lit up on my table! 🙂 Hope you have a great night! LOVE, LOVE, LOVE this Amanda!!! The gold is SO pretty! So beautiful when they are lit up! What a fun decoration! Thank you, Carrie!! They have such a pretty glow on the wall all lit up! 🙂 Hope your week is going great! These are so pretty Amanda! Love the gold!!! I love this!!! So easy and frugal! Thank you Selene!! Frugal is awesome. 🙂 Have a fab weekend, friend! These are amazing! Just looking at them make me smile. 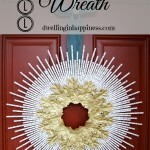 Even someone as craft challenged as I am can make these. Thank you, Edna! These were really easy to make, you’d do great! 🙂 Hope you have a fabulous weekend! 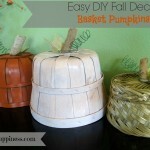 Pingback: Great Ideas -- 25 DIY Thanksgiving Ideas (Part Four)!! I love a good “upcycle” and this is a great one. Thank you for linking up to “On Display Thursday”. We hope to see you again this week! Thank you, Carmody! I love upcycling too, so much cheaper! 🙂 Have a great day! So fun and festive, Amanda! Love them! Hey, I think your site might be having browser cottimabilipy issues. When I look at your blog in Ie, it looks fine but when opening in Internet Explorer, it has some overlapping. I just wanted to give you a quick heads up! Other then that, superb blog! How cute are these! These would be so fun to do for valentines day! Actually any holiday these would be perfect! It was so fun joining you for this blog hop! Thanks Shonee!! I agree, they’d be so cute for any holiday! I might need to save more cans and make more! 🙂 Hope you have a great rest of the week!